The Justice League gathers at the Watchtower. J'onn J'onzz, aka, Martian Manhunter stands apart from his fellow team members, unsure how to fit in. J'onzz walks the reddened landscape of Death Valley pondering his purpose and place in a world not his own. In Tokyo, J'onzz borrows the identity of Detective Yamada. 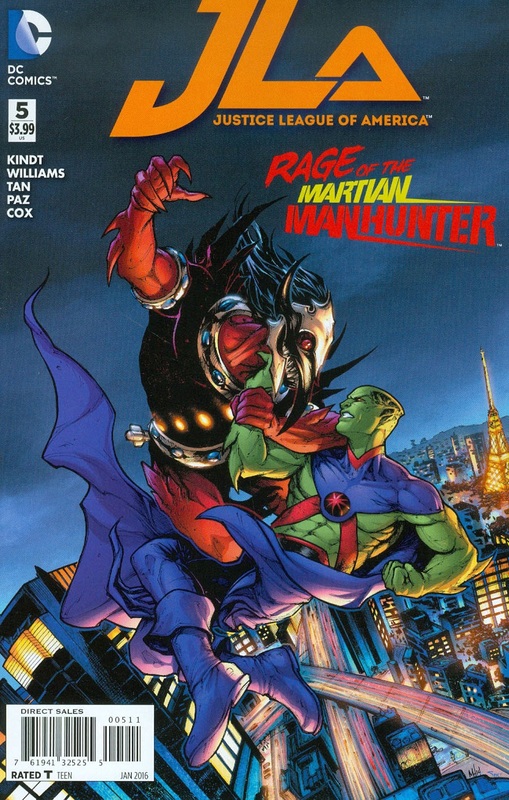 He is tracking a serial killer by the name of Thoth, an alien who claims to have killed the entire Martian population while Manhunter was off planet. Police cordon off a murder scene at Thoth's latest victim's apartment. J'onzz watches as Thoth comes out of hiding, tearing himself out of a forensic analyst's body as though it were a plastic bag. As Thoth reveals himself, he tells J'onn after inhabiting so many different bodies, he has forgotten his true self. He is simply known as "The UnNamed." Manhunter and The UnNamed fight. But the killer needs a new body to inhabit. He finds an old man, however J'onzz acts quickly. Manhunter takes the old man's mind, storing it within his own. Caught off guard, and with no mind to feast on, The UnNamed is left vulnerable. J'onzz obliterates his foe in two punches, leaving no trace of him. J'onzz has found his purpose on Earth. He likes humans. He will save them. He will be a hero. Aquaman tries to drive out Rao's prophets from Atlantis. His people turn on him. Their conversion into disciples of Rao is complete. On Themyscira, the Amazonian warriors resist, but they cannot hold their ground. Rao controls Themyscira and Atlantis and is about to take the Fortress of Solitude. At the Fortress, Superman takes out a legion of prophets. But Rao punches him across the Arctic circle, then renders him unconscious with a second blow. The Flash wakes up at Infinity Corp's headquarters in 1961. Lots of questions; no answers. The Flash needs to get back to present day. Wonder Woman is abandoned on the tattered remains of Olympus. A voice tells her that Olympus is hers now. She is Olympus. In Atlantis, the prophets are establishing a connection with the other locations to open a doorway. Aquaman tries to stop them, but it is too late. The door opens, and they are transported to Olympus. With the combined powers and sacrifice from a circle of prophets, Olympus is obliterated. Two hundred and fifty thousand years ago, on the planet Krypton, Hal and Rao travel to Argo to meet the leader of the resistance. They are stopped in their tracks as they see a modern day Infinity Corp building. Cyborg hacks into a staff taken from one of Rao's prophets. He is overwhelmed processing the vast amount of information in both the staff and the Cathedral it uplinks to. But, as it turns out, there are thousands of cathedrals dispersed throughout the galaxy. With this technology, billions of people are linked to Rao, feeding him power. Stranded on Mount Olympus, Wonder Woman and Aquaman raid the god's armory in preparation for battle. Argo City, 250,000 years ago, a young Rao and Hal Jordan enter a modern day Infinity Corp building. They encounter their previously unseen enemy, Rao: from the future. The older, and more powerful Rao plans on recapturing Krypton. Inside another time's Infinity Corp building, The Flash and Dr. Vincent brace as the building crashes "somewhere." Superman is held captive in the heart of the cathedral. His plea for Rao to be honest with the people of Earth falls on deaf ears. Rao plans to genetically modify human DNA into an Earthling/Kryptonian hybrid. This will feed him even more power. Still bound, Superman crashes Rao's Cathedral into the moon. Brainwashed followers and prophets wonder where Rao has gone after watching the Cathedral abandon Earth in the previous issue. What they don't know, is that Superman crashed the gargantuan satellite into the moon. From the wreckage, Superman and Rao fight until Superman plows them both into a mountainside back on Earth. Despite the one-sidedness of the exchange, Rao rises unscathed. The destruction of the Cathedral has severed Rao's connection to the satellites around the galaxy, but he is still able to draw power from the people of Earth. Therefore, Superman's blows only harmed Rao's coerced disciples. Rao beats on Superman, who is badly hurt and out of options. Aquaman and Wonder Woman attempt to save the day with weapons they took from the Mt. Olympus Armory. Superman stops them, as again, it will only hurt the people of Earth. But Superman assures them: there's a plan. One hour ago: Batman sends a transmission to Superman. "Just buy us an hour." 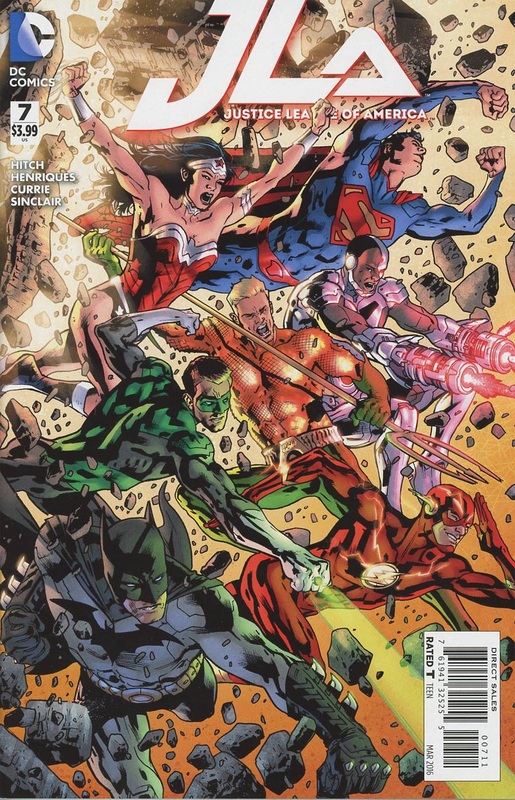 Present: A boom tube opens up, Wonder Woman pushes Rao through, the heroes follow. They tumble into the new Metropolis power plant. A half hour ago: Batman makes a deal with Parasite. If he survives, he gets set free. Present: Parasite jumps Rao, feeding off of his immense power. The idea is to use Parasite as a battery to recharge the damaged power planet (from the first issue) then shock Rao like a heart attack patient with an overgrown defibrillator. It should sever Rao's connection to his indoctrinated followers around the world. After adding the power of Aquaman, Wonder Woman, Superman, and the Flash's speed force to the mix, the plan works, but at a cost. 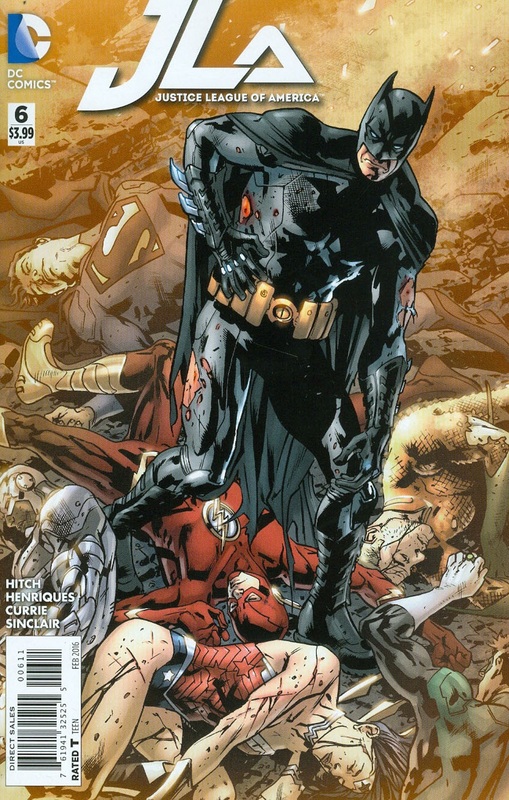 Weakened, Rao escapes to capture the Stones of Forever, and Superman is dead. With Earth as collateral damage, the Kryptonian deity called Rao has the Justice League on the ropes! 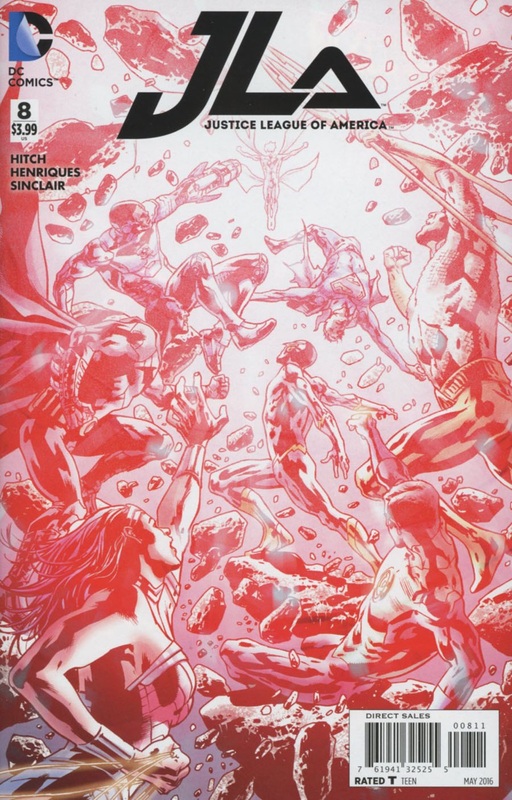 The Flash manages to escape from Rao's clutches, whilst green Lantern sits in a cell on Argo, attempting to reconnect with his ring. Wonder Woman tries to revive Superman to no avail. Frustrated at the appearance of his death, Wonder Woman thrusts her lightning bolt at Superman's lifeless body, which brings the Man of Steel back to life. 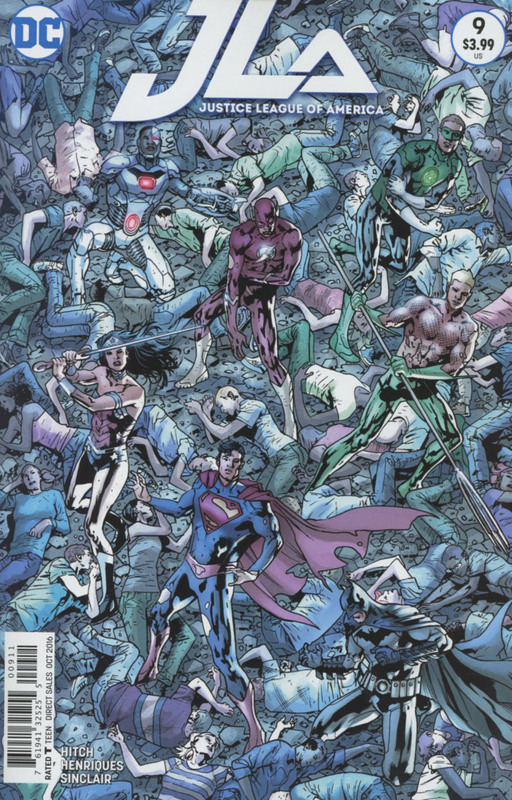 The Justice League's rejoicing is cut short, as they realize that Rao has bought Krypton to Earth.